LA NOSTRA PASSIONE PER IL BULLMASTIFF NACQUE QUALCHE ANNO FA, QUANDO UNO DEI NOSTRI CANI SCOMPARVE PREMATURAMENTE E CI TROVAMMO DAVANTI ALLA SCELTA DEL NOSTRO NUOVO AMICO A 4 ZAMPE. PER CHIARICI LE IDEE ANDAMMO A VISITARE UN'ESPOSIZIONE CANINA, CON BEN IN MENTE UN PAIO DI RAZZE CON LE QUALI VOLEVAMO APPROFONDIRE LA CONOSCENZA, TRA CUI IL BULLMASTIFF. APPENA ARRIVATI IN ZONA BULLMASTIFF FUMMO RAPITI DALLA BELLEZZA DI QUESTI GIGANTI BUONI, CHE GIA' DALLO SGUARDO DICONO MOLTO DEL LORO FANTASTICO CARATTERE. PARLAMMO CON ALLEVATORI E APPASSIONATI LI' PRESENTI PER QUELL'OCCASIONE, E QUANDO USCIMMO PER TORNARE A CASA AVEVAMO GIA' LE IDEE BEN CHIARE, DECISI AD ACCOGLIERE UN BULLMASTIFF NELLA NOSTRA VITA. COME CI DISSERO ALCUNE PERSONE, IL BULLMASTIFF E' UN CANE CHE TI CATTURA L'ANIMA, FINO AL PUNTO CHE POI DA UNO TI RITROVI AD AVERNE ALCUNI, E COSI' E' STATO ANCHE PER NOI. PER NOI I NOSTRI BULLS SONO PARTE INTEGRANTE DELLA NOSTRA FAMIGLIA BIPEDE, INFATTI VIVONO IN CASA CON NOI, DORMONO CON NOI, PARTECIPANO A TUTTE LE ATTIVITA' DELLA FAMIGLIA, VIVONO LA LORO GIORNATA SEMPRE CON NOI, PERCHE' PER NOI NON SONO SOLO CANI, E TUTTO VA A GRANDE VANTAGGIO DEL LORO GIA' FANTASTICO CARATTERE. L'AMORE PER QUESTA RAZZA E' CRESCIUTO POCO A POCO, FINO A DIVENTARE VERA PASSIONE CHE CI COINVOLGE TUTTORA E CI PORTA IN GIRO PER L'ITALIA E L'EUROPA PER PARTECIPARE ALLE MANIFESTAZIONI CINOFILE PIU' IMPORTANTI. NON SIAMO ALLEVAMENTO "INDUSTRIALE". NON FACCIAMO PIU' DI 2 CUCCIOLATE ALL'ANNO E SOLO SU PRENOTAZIONE. LE NOSTRE FATTRICI NON PARTORISCONO PIU' DI 3 CUCCIOLATE NELLA LORO VITA E FIGLIANO AL MASSIMO FINO AI 5 ANNI DI VITA. PERCHE' PER NOI NON SONO MACCHINE DA RIPRODUZIONE! OUR PASSION FOR BULLMASTIFF WAS BORN FEW YEARS AGO, WHEN ONE OF OUR DOGS DISAPPEARED AND WE DISCOVERED AT THE CHOICE OF THE OUR NEW FRIEND TO 4 PAWS. FOR THIS REASON WE HAVE GONE TO VISIT A DOG SHOW TO KNOW BETTER A COUPLE OF BREEDS , INCLUDING THE BULLMASTIFF. JUST ARRIVING IN BULLMASTIFF'S ZONE, WE WERE CAPTIVATED BY THE BEAUTY OF THESE GOOD GIANTS, WHO ALREADY LOOKING THE SIZE THEY TELL MUCH OF THEIR WONDERFUL CHARACTER. AND TALKING WITH BREEDERS AND OWNERS , WE RETURNED TO HOME WITH ALREADY A CLEAR IDEA, DECIDED TO ACCEPT A BULLMASTIFF IN OUR LIVES. OUR BULLS ARE AN INTEGRAL PART OF OUR FAMILY , LIVE INSIDE HOME WITH US, SLEEPS WITH US, PARTICIPATES AT ALL FAMILI'S ACTIVITIES, LIVES THEIR DAY ALWAYS WITH US, THAT'S WHY FOR US THEY ARE NOT ONLY DOGS AND EVERYTHING GOES TO GREAT ADVANTAGE OF THEIR BEAUTIFUL CHARACTER. THE LOVE FOR THIS BREED IS GROWNED LITTLE GRADUALLY TO BECOME REAL PASSION THAT WE INVOLVES , AND SO WE GO IN TOUR TO ITALY AND EUROPE TO TAKE PART AT THE MOST IMPORTANTS DOGS' SHOWS..
WE ARE A VERY SIMPLE FAMILY, AND WE ARE A SMALL RUN KENNEL, SITUATED IN THE NORTH-EAST OF ITALY, NEAR VENICE, PADOVA AND VERONA. WE ARE MEMBERS OF THE ITALIAN MOLOSSER CLUB. OUR BULLMASTIFF LIVES ALL THE DAY WITH US, IN OUR HOME, NOT IN KENNEL, THEY SLEEPS IN OUR BEDROOM, AND ALL THE FAMILY ACTIVITIES ARE DECIDED THINKING OUR BULLS. SO THEY ARE NOT ONLY PETS, BUT TOTALLY FAMILY'S MEMBERS. ALL OUR BULLMASTIFFS HAVE SO EXCELLENT CHARACTERS, TEMPERAMENTS AND BONE STRUCTURE, SELECTED FOR TIPICITY, HEALTHY AND TEMPERAMENT. AND THIS IS THE BEST WAY TO KNOW HOW FANTASTIC IS TO LIVE WITH A BULLMASTIFF! 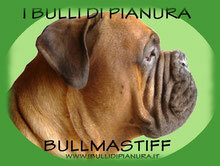 WE LOVE GO ON DOGS SHOWS IN ITALY AND EUROPE, TO KNOW OTHER BULLMASTIFF'S FUNS AND HAVING FUN WITH THEM!